Today I’m teaming up with Everlane to share with you their new Crossbody Bag, launching today! It’s a beautiful mixed media bag with sleek leather and a luxe suede flap. It posesses a chic minimalist vibe, that can take you from running errands to date night. When I first discovered Everlane, I was so intrigued with both their story and business model. If you haven’t heard of Everlane already, it’s a brand dedicated to providing high quality products, with low markups. How do they do it? They source and design in-house, essentially cutting out the middle man. They also provide transparency for each product, letting their customers know how much each product cost to produce, how much they sell it for and how much a traditional retailer would sell it for. I have several Everlane pieces in my closet and while I love the silhouettes of their designs, I’m completely addicted to the fabrics they use. The soft cashmere, the buttery silks and the rich leathers, they feel just as beautiful as they look! Thanks to Everlane for sponsoring this post. All opinions remain my own. Loving the gray tones and peach shirt! Such an unexpected color combo! Pretty outfit! Love the bag and shoes! The outfit is so great! I really like this kind of clothes and color combination. Quite simple, but so comfy and stunning! Marvelous casual look. I love your new crossbody bag and the cool booties! So cute, Rachel! I love the grey/black color combo, those are go-to colors for me. Those boots are gorgeous. My Everlane T-shirt is one of the comfiest things in my closet! 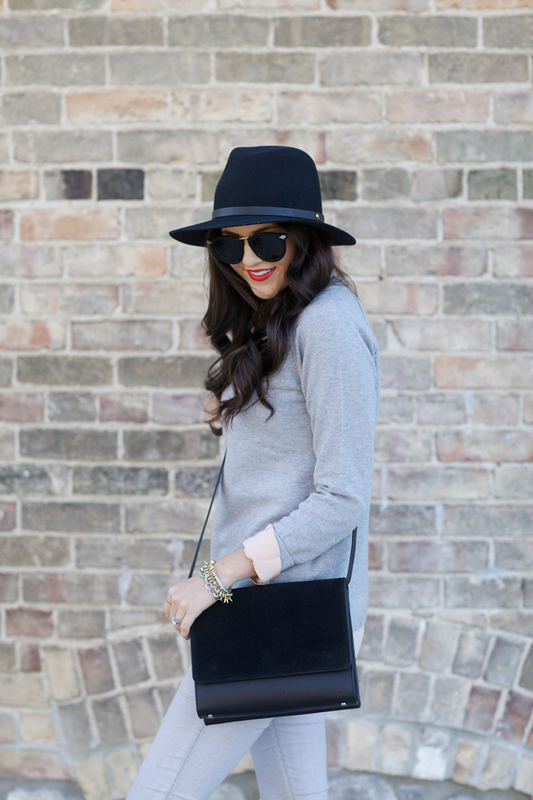 I love this Everlane bag and how you styled it with the grey hues and amazing black boots! I love this all grey outfit! It’s so sleek! And that bag is amazing!!! I’ll have to pick it up! Absolutely love the blush blouse you’re wearing! Adds the perfect subtle pop of color! Love this outfit! Great colours. Fabulous black and grey outfit! Love your boots big time! This look is SO lovely! Love the grey and black combo. And that hat is so sweet! You’re right. That sounds like a wonderful business model! I am excited to learn more about Everlane. I love that bag!! I’m all about mixed mediums right now- gives such dimension to a look! I love Everlane! I just got the email about their new purses but am kind of disappointed by them. I love that sweater and shirt combo though! Very pretty! I think the link for the everlane bag is linked to a pair of weitzman boots from a previous blog entry. As an avid reader, I just wanted to give you the heads up! Love the the sweet girlie look with a splash of edgy! My favorite kind of style on you! Obsessed with this! So simple and chic. I’ve been following Everlane for a while now and love all of their pieces! I’m in the process of curating a wardrobe filled with well-made staples, and Everlane is a must for me. That bag is beautiful! Well. The entire look is beautiful, I love your boots! Very cute fall look from Everlane! Love the handbag. Love this look! Those boots are gorgeouss! Great look – the bag looks very versatile! The simple black accents to your outfit are beautiful! This outfit is so chic and casual! Love the pop of red from your nail polish and lipstick…so cute! Hey Rach nice colour combo and i liked the simple chic look. Hey Rach nice color combo and liked the simple chic look. The link to the bag is broken. It is linked to the Lowland boots. I love how you combined all-gray outfit! The hat is such a chic accessory! Such a great look! Loving that sleek bag. Can’t go wrong with gray and black! Those 50/50 boots are soooo comfy, aren’t they? As always, another outfit I now have to have! Love everything from everlane, especially the ryan long sleeve tee and the cotton lawn shirt, such classic pieces, so well made and well priced! I’m a huge fan of Everlane, too! They have a lot of great classic pieces that are made so beautifully. I love the neutral colours! I love your accessories here! The bag is beautiful, as are the boots and hat, and throwing the three together creates such a nice completed look. Beautiful! The all grey look anchored with black accents & a hint of peach is spectacular! I love how you took and everyday look and elevated it to ultra chic while still keeping it soft & comfortable. The Everlane bag is gorgeous. I love the mix of textures. You showcased it perfectly with this look! I love the idea of gray-on-gray! Love how you played it up with black accents, but kept the outfit to one color. Gorgeous! I absolutely adore this color combo! 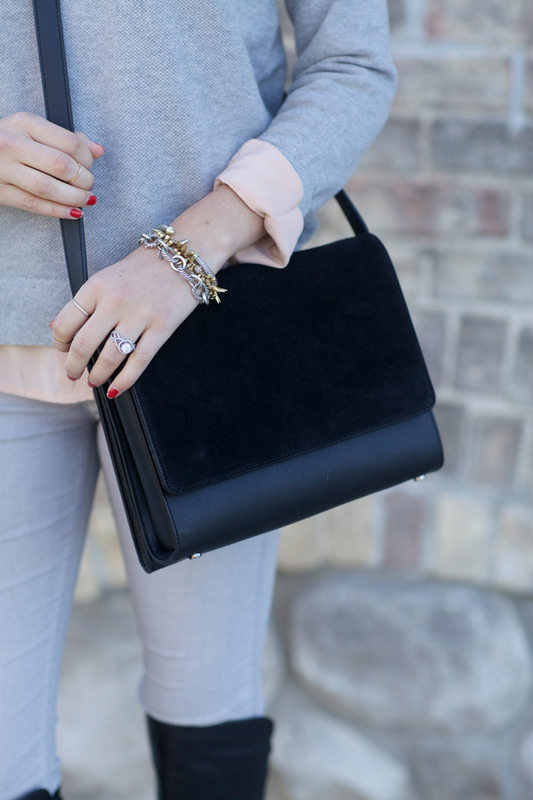 The grey & black with the soft pink is so perfect. Love this grey and black look! That bag is gorgeous too, the mix media is perfect! Loving this casual yet polished look! I especially adore those over the knee boots and that sleek black bag! Wow, such a gorgeous cross body bag! Love that bag and those boots! love the boots with the classic outfit! love that peachy blouse peeking through that grey ensemble. and that is such a fun hat! thanks for sharing. Honestly so obsessed with this semi-monochromatic look. I love the shades of gray, black and the pop of that gorgeous peach blouse. You always look so flawless and incredible. I’m dying to get my hands on that Rag&Bone hat. I also love that you included some info about the brand, definitely made me want to check them out even more. I think it’s an incredible concept that they seem so honest and open with customers. Such a great post. I love that hat. It’s perfect! I like the purse because it looks like its really good quality. This is the perfect autumn look, adore the boots! Gray on Gray with black accents is one of my favorite fall looks! Love that lip color and your hair looks fabulous! Amazing outfit! Loved the OTK boots. Stunning look! Your bag and boots are just amazing ! Nice outfit! I love those boots!